Bich Minh "Beth" Nguyen will join us Summer 2018 for The Normal School's Summer Nonfiction Workshop and Publishing Institute, July 16-29, on the campus of Fresno State University, where she will lead workshops, participate in panel discussions, and meet one-on-one with students. Apply now. Scholarships and course credit available. In regular life, Bich Minh Nguyen goes by the name Beth. She is the author of three books, all with Viking Penguin. Stealing Buddha's Dinner, a memoir, received the PEN/Jerard Award from the PEN American Center and was a Chicago Tribune Best Book of the Year. It has been featured as a common read selection within numerous communities, schools, and universities. Short Girls, a novel, was an American Book Award winner in fiction and a Library Journal best book of the year. Her most recent novel, Pioneer Girl, is about the mysterious ties between a Vietnamese immigrant family and Laura Ingalls Wilder. Nguyen has been a Bread Loaf Fellow, among other honors, and her work has appeared in anthologies and publications including The New York Times. She is at work on a series of essays about high school, music, and the Midwest, called Owner of a Lonely Heart. She has also coedited three anthologies: 30/30: Thirty American Stories from the Last Thirty Years; Contemporary Creative Nonfiction: I & Eye; and The Contemporary American Short Story. Tara Williams: In the event of a zombie apocalypse and your imminent evacuation taking only what you can carry, which books would you take with you to a remote island compound serving as the last bastion of literate civilization? Bich Minh Nguyen: This is an incredibly difficult question to answer! Right now the answer might be: Collected Poems of Emily Dickinson; Song of Solomon by Toni Morrison; Pride and Prejudice by Jane Austen; and if there’s room, Emily Wilson’s recent translation of The Odyssey. TW: The resonance of the choice to build your memoir around food memories is fascinating to me, especially with the dual meaning of the word assimilation, with its social and digestive connotations. I'm curious whether you started your memoir with this central theme in mind, or if it evolved as part of your writing process. BMN: It evolved, definitely. When I started writing this, I didn’t know it was going to be a book. It was just an essay. And then another essay, and another. I had no great hopes or aspirations. But then I realized that I kept returning to food, and that food moments were natural markers for time, memory, significant events. And that’s basically how the pages became a book—when I recognized that food was the main anchor and symbol. Every book-length project needs an organizing principle, and food became mine. TW: It struck me as I was reading that you are a kind of pioneer in the terrain of establishing American identity space for people who are not outwardly Euro-American in physical appearance but for whom American culture is a dominant influence. What does being American mean to you? Do you think there are definitive American cultural traits beyond consumerism and pop culture? BMN: This is a tough question in late 2017. I grew up thinking that to be an American was to have the privilege of freedom—of expression, of ideas, of movement. I grew up with this belief that surely America is the best place to live. That is now in question, in this current administration. But what’s also in question is the definition of “American culture.” Basically I’ve been taught (most people are still taught) that “American” = white, and that white is the norm and the default; everyone else is still expected to assimilate, and ask if they belong, and wait to be included. If there’s one good thing to emerge from this current political landscape/nightmare, it’s a growing national awareness that that old model doesn’t hold up and cannot stand. TW: I notice after your memoir, you have published two novels. Could you elaborate on your choice to switch genres in your writing? BMN: I studied fiction and poetry in college and grad school. I started writing creative nonfiction out of pure frustration with myself, because every time I tried to write about my family’s story through fiction it didn’t sound quite real—because it wasn’t! It took me years to realize that I needed the genre of truth in order to tell the truth. (This isn’t the case for all stories, of course, but it was for mine.) And then it was like I’d gotten something out of the way for myself, in my head, which allowed me to write the fiction I’d always wanted to write. People often think my novels are autobiographical but I’d say they’re probably 80% fiction; the autobiographical parts are mainly about setting. My next book, which I’m still working on, is a series of linked essays about high school, college, music, and post-refugee life; it’s currently titled “Owner of a Lonely Heart." I encourage every writer to be fluent in more than genre, or at least to explore or try out other genres. Doing so opens up possibilities and ideas, and sometimes we have to let the genre choose the work. TW: In many ways, it seems the current presidential administration embodies and seems to promote many of the xenophobic attitudes you encountered as a child. Does this affect you in any way? BMN: I think we are all affected by this, daily and deeply, though yes, people of color and immigrants are affected in a far more urgent way. The people I worry about the most are the ones whose safety and status are being threatened. The racism and xenophobia I experienced and witnessed in my childhood has not changed. In many ways, it’s gotten worse. TW: Do you still eat junk food? If so, what, how often, and under what conditions? BMN: I eat a lot of gummy bears. Does that count as junk food? I also love pizza rolls (except they’re Annie’s organic, which seems ridiculous even to type) and I’m a huge fan of bad pizza and frozen pizza. For the most part though, I have to admit that I don’t really eat the kinds of junk food that I dreamed about when I was a kid. I think for three reasons: once I had total access to it as an adult, the allure went away; as I grew more socially and politically aware, and more able to accept my own identity, junk food no longer held the same kind of symbolic power or value; and I realized most junk food just doesn’t taste good! For example, I haven’t had a Coke or Pepsi or any similar kind of soda in probably 20 years, simply because I don’t want to. They don’t appeal to me at all. I feel very grateful that my grandmother Noi taught me to have a good relationship with food—to think of it as something that can add joy and goodness to one’s day. TW: I see your memoir has also been optioned for movie development, and I'd ask about that too, but I know authors don't always have much say in how such a project develops. BMN: You are right that I have no say in any of this. I do think it’s very strange and kind of hilarious! 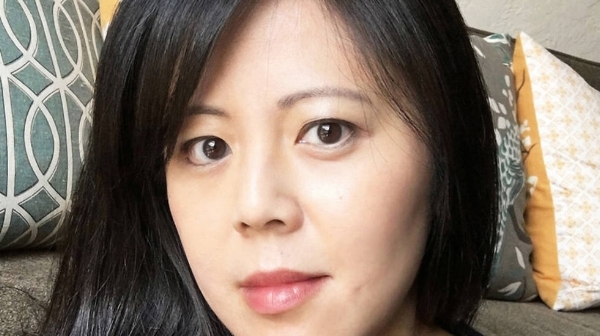 Bich Minh "Beth" Nguyen received an MFA in creative writing from the University of Michigan, where she won Hopwood Awards in fiction, nonfiction, and poetry. She currently directs and teaches in the MFA in Writing Program at the University of San Francisco. She and her family live in the Bay Area. Tara Williams is an MFA candidate in Fresno State's Creative Writing Fiction program. She has previously published nonfiction books and articles on natural healing modalities, and interviews with cultural icons including Leonard Peltier, Russell Means, Julia Butterfly, and former WIBF World Champion boxer Lucia Rijker, "The Most Dangerous Woman in the World."